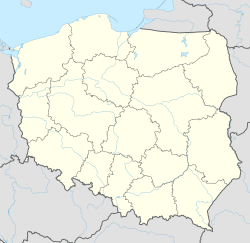 Lubawka [luˈbafka] (German: Liebau) is a town in Poland, in Lower Silesia Voivodship, in Kamienna Góra County. It is the administrative seat of Gmina Lubawka. It lies in the Sudetes near to the border with the Czech Republic on the way across the Lubawka pass (516m) between the Karkonosze and Krucze Mountains (Czech: Vranní hory). Two small rivers, the Bóbr and Czarnuszka, run through the town, which has 6,529 inhabitants (2006). The first written reference to Lubawka is from 1284 when it was written down as Lubavia. From 1292 to 1810 it belonged to the Cistercian monastery in Krzeszów. The whole domain devolved to the Czech Kingdom in 1392. The town was destroyed twice during the Hussite wars in 1425 and 1431. From 1526 it becomes part of the Habsburg Empire. Another great war disaster hit Lubawka when the Swedish army during the Thirty Years War totally despoiled the city which was abandoned by its inhabitants for more than six months. The city developed rapidly in the 18th century, particularly due to growth in the textile industry there and in surrounding villages. Unfortunately, several great fires damaged the city in those times. The largest one in 1734 destroyed the town hall, school, church, vicarage and almost all buildings. In 1810 when the Cistercian monastery in Grüssau was abolished, Liebau in conjunction with Schömberg began to develop on their own. The railway, a great incentive to faster development, arrived in Liebau from Ruhbank in 1867. Several years later it was extended to Královec (German: Königshof) and connected with Schatzlar and Trautenau which are now part of the Czech Republic. In those times coal mining reached prosperity. At the end of 19th-century Lubawka and the surrounding villages became very well known as a destination for tourism. The German Olympic team used a facility built near Lubawka to prepare for the Berlin Olympic Games in 1936. During the era of the Third Reich the facility was used by Hitler-Jugend as a training and recreation center. In 1944, a branch of the Gross-Rosen concentration camp was established in the city to house 500 Jewish women sent from Auschwitz. On May 7, 1945, the town was occupied by the Soviet Red Army. The area was settled by Poles, some of whom transferred from the eastern parts of Poland which had been joined to the Soviet Union, and from the neighbourhood of Nowy Sącz in south-east Poland. The city was renamed as Lubawka. The town is mentioned in the version of the 1964 song Universal Soldier by Buffy Sainte-Marie released in 1965 by Scottish singer Donovan; the original used Dachau. Wikimedia Commons has media related to Lubawka.